If you have ever been lucky enough to watch a huge flock of birds – perhaps massed ranks of waders at high tide, or a starling roost in winter – then you’ll know it can be an impressive sight. When the flock includes tens of thousands of what is a relatively scarce breeding species in Britain, it is even more special. On Tuesday last week we visited Grand Lac at Djoudj National Park. Djoudj is an incredibly important wintering site for Garganey. It is estimated that a staggering 150,000 migrate here from Europe each winter. At Djoudj they take advantage of rich foraging alongside thousands of other wildfowl, including more than 200,000 Pintail and 100,000 White-faced Whistling Ducks. Grand Lac is the largest area of open water in the park and, consequently, is where a big proportion of the wintering ducks congregate. In some parts of the lake it is hard to see the water for the birds. Tens of thousands of Whistling Ducks, Garganey, Pintail and Shoveler come together in huge groups either to roost or feed. 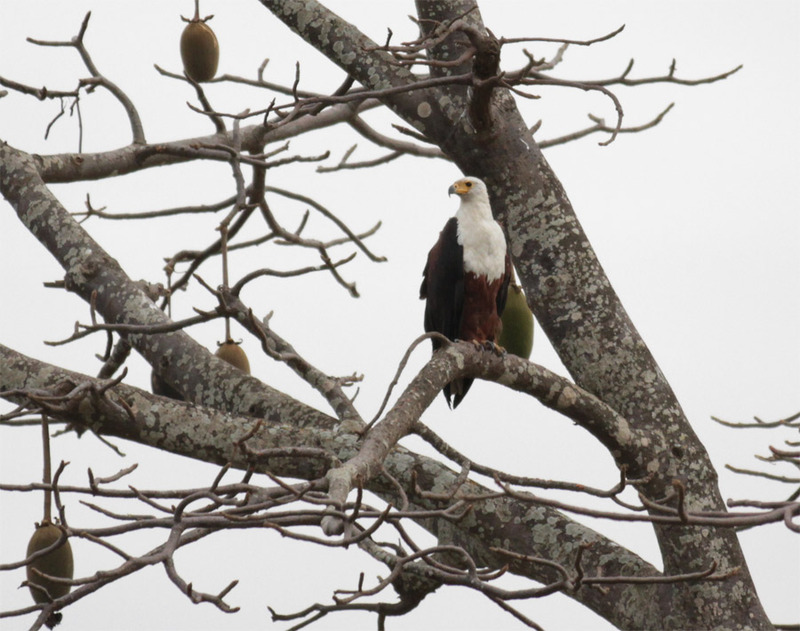 That is an incredibly impressive sight in its own right, but should an African Fish Eagle happen to fly over, then it just gets better. Almost without warning the sky can be filled with up to 100,000 ducks, all grouped together in huge swirling masses. As you have probably guessed, our stay in northern Senegal just got better and better. We had three full days in Djoudj, just enough time to begin to appreciate how special a place it is. Aside from the wildfowl, we saw countless Jackels, Warthogs, Montague’s Harriers, Collared Praticoles, Kittlitz’s Plovers and numerous European migrants. 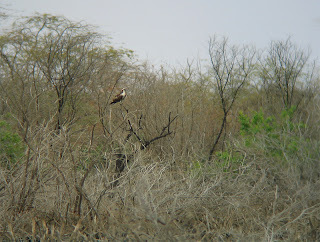 It goes without saying that we also saw plenty of Ospreys. 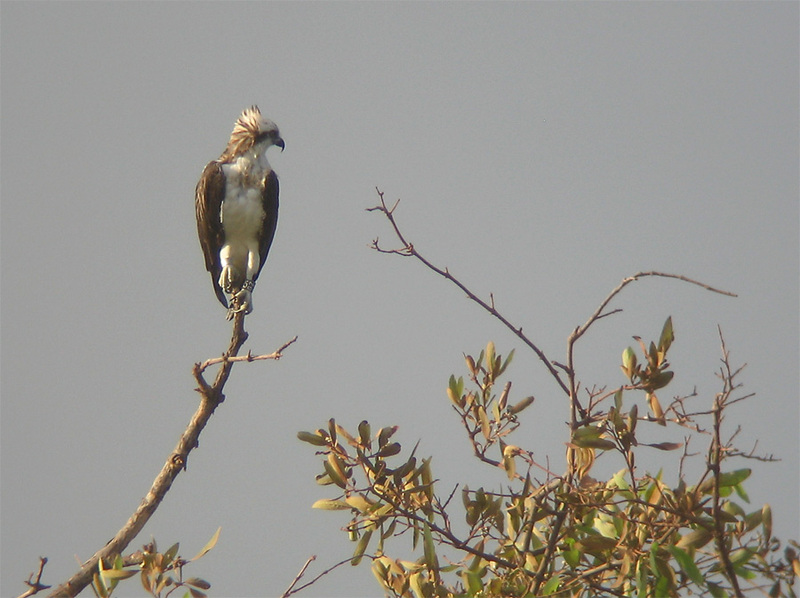 One of our most memorable Osprey sightings, perhaps of the entire trip, came during our second morning in Djoudj. 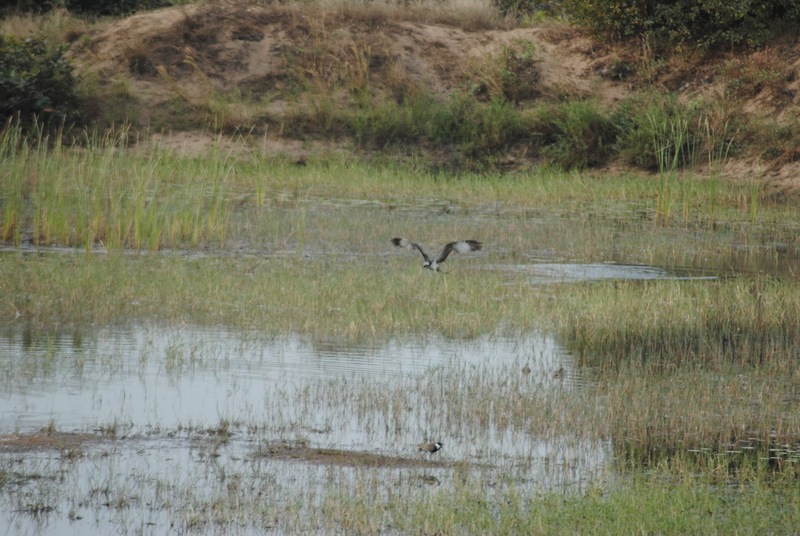 As we drove through the southern part of the park we came across an unringed adult male Osprey eating a fish on one of the vast open plains, typical of the sahel. As the bird tucked into his meal, a sandstorm suddenly whipped up, and huge clouds of sand engulfed the bird. 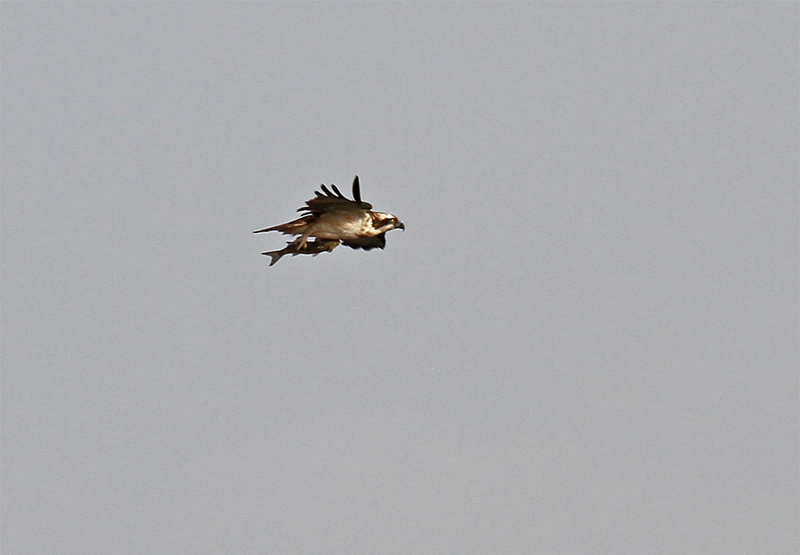 For a few minutes it was as if we and the Osprey had been transported to the middle of the Sahara. 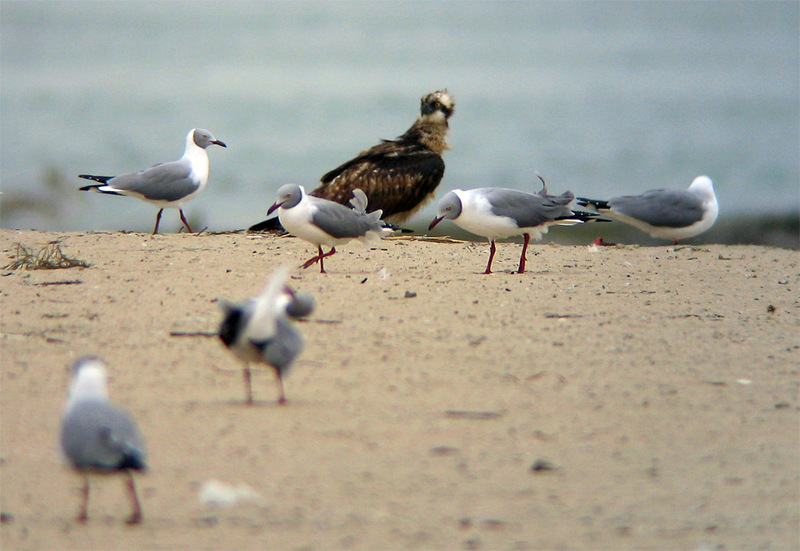 As we struggled to see through the sand, the bird seemed totally unconcerned. Having crossed the desert a few months ago, this would not have been the first time that this bird had experienced such a sandstorm. For us though it was a reminder of the epic journey that the birds must make twice a year. By the middle of our final week we had identified Ospreys from at least four different countries, with German birds by far the most numerous. 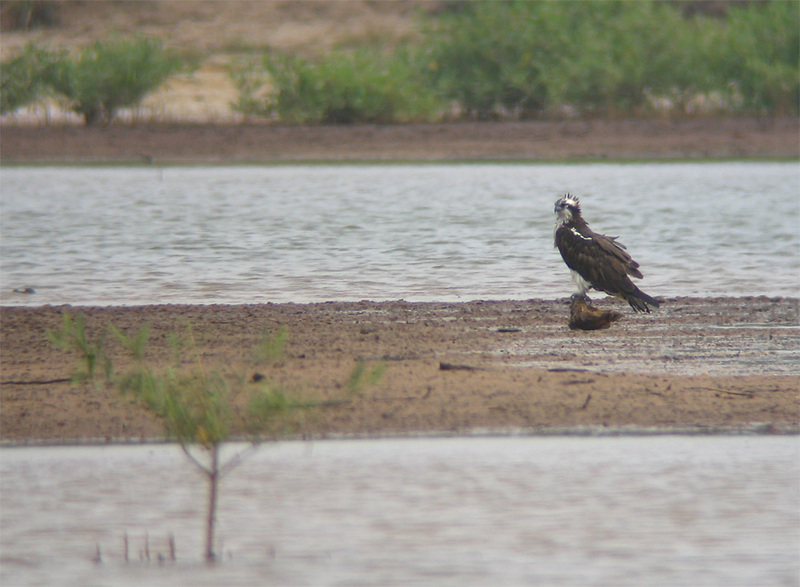 Having identified two German colour-ringed Ospreys on our first visit to Djoudj, we doubled our tally second time around. One of the birds, a juvenile female, came and ate a fish very close to one of the hides where we were admiring the wildfowl. I wonder if she will now adopt Djoudj as her winter home and return and eat her fish alongside the Garganey each winter? With all due respect to the Germans though, by far the most significant colour-ring sighting of the entire trip came during our final afternoon in Djoudj. We had spent much of the day at Lac De Gainth, sheltering from a strong easterly wind that was blowing sand direct from the Sahara. Chiffchaffs and Sedge Warblers were busy searching the marginal vegetation for food, a four metre Crocodile was basking on the shoreline and two African Fish Eagles sat quietly beside the lake. And suddenly an adult female Osprey came into view. She was so close that through binoculars it was possible to see white ring on her right leg. This told us that she was English. John managed to take a few photos of her before she disappeared over our heads and out of sight. Our hearts were in our mouths as he zoomed in on the photo. 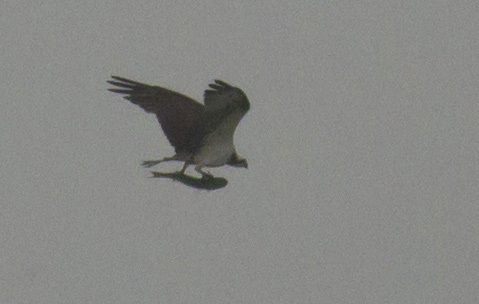 Could it be an Osprey from Rutland Water? We could see a ‘Y’ on the first photo. So far, so good. Then on the second photo we could make out the second digit. It was a ‘U’. So the bird was white/black YU. Not one from Rutland Water, but a female ringed by Pete Davies at the Bassenthwaite nest in the Lake District in 2007. Of course we were disappointed that it wasn’t a Rutland Water bird, but we were elated that, having travelled more than 3000 miles from the UK, we had found an English Osprey. This was confirmed when I received a text message from Pete an hour later to confirm it was one of the Lake District birds. Fantastic! Whilst Djoudj was the undoubted highlight of our time in northern Senegal, we visited numerous other sites within the Senegal delta. On Sunday, Frederic Bacuez, our very knowledgeable guide, kindly organised a seven hour boat trip along the vast Senegal River from his home in Bango to Diama, where a huge dam was constructed across the river in the 1980s. The river forms the border between Senegal and Mauritania, so of the thirty or so Ospreys we saw along this particular fifteen kilometre stretch, at least half were in Mauritania. By early afternoon the tide was dropping and we were treated to some great views of fishing Ospreys (and an African Fish Eagle) very close to the boat. In tidal areas such as this, the birds usually save their fishing for low tide, when seeing and catching fish is easier. The birds were so numerous that at various times during the afternoon it seemed that everywhere we looked, there were Ospreys. Before travelling up to the north of Senegal, I had wondered if the birds would be as common as they are in Gambia and southern Senegal. 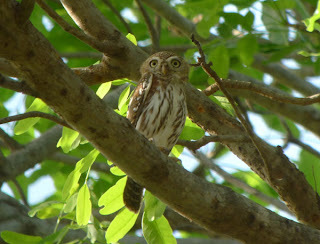 Our ten days with Frederic proved, that in the Senegal delta at least, they most certainly are. After almost two weeks in northern Senegal we made the eight hour journey back to Banjul on Sunday morning. I say eight hours, but it actually took much longer. That though is too long a story to go into now. The main thing was, we made it back to Gambia and to the Paradise Inn Lodge in Tanji. 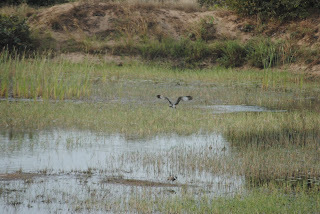 Tanji was where we saw our first West African Osprey and so it seemed fitting that we finished our trip here. We rose early on Monday, our last full day, and headed straight down to Tanji beach, arriving just as the sun appeared over the horizon behind us. As if on queue, Ospreys began arriving immediately. We had close views of at least four different birds, one of them yet another colour-ringed German female. She made several unsuccessful fishing trips along a channel that runs out to the see a few hundred metres from Tanji village. After each fishing foray she returned to a tree just back from the main road. 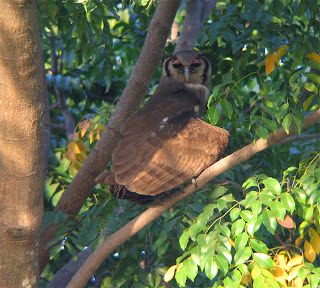 The tree provides a clear view of the channel and is obviously a favoured perch. 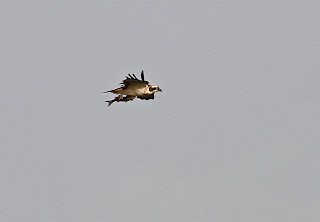 If another Osprey dared to even look at ‘her’ fish, the female wasted little time in chasing the impostor away. It is interesting that some Ospreys we have encountered during the past month become very possessive of a certain fishing spot whilst others seem content to let other birds do as they please. This German female certainly fits into the former category. 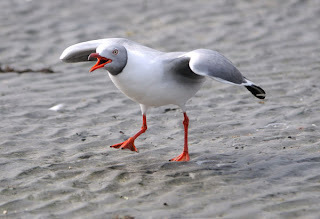 One of the birds she chased away was a juvenile female, who having been given her marching orders flew a little to the east and began fishing beside the beach where every morning, fishermen return with their catch. Tanji is the foremost fishing village in the Gambia and each morning the beach is a hive of activity with literally hundreds of people jostling for position on the sea front waiting for the boats to return, laden with fish. The young Osprey seemed totally oblivious to the activity taking place below her and crashed into the water between fishing boats, just a few metres from the beach. Although her dive was unsuccessful, seeing this young Osprey fishing so close to people, served to highlight the delicate balance that exists between people and wildlife. The fishing community of Tanji relies heavily on income generated from fishing. 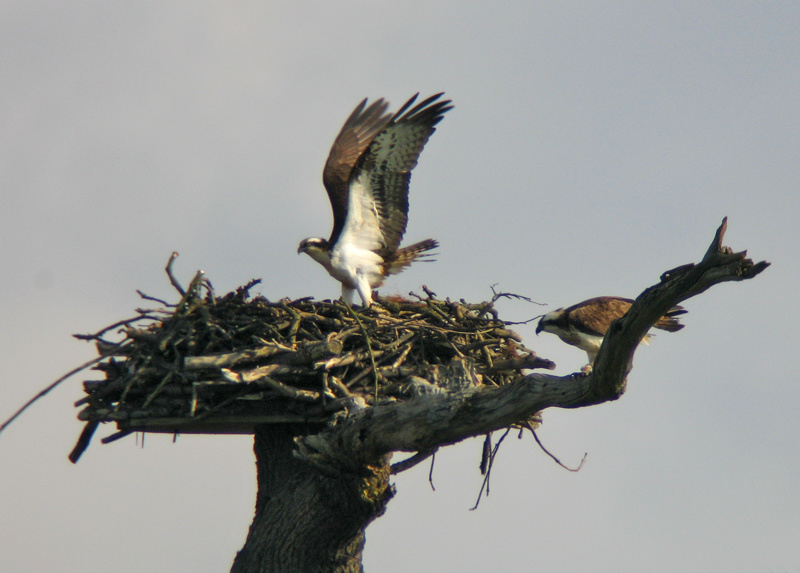 At the same time, the seas provide a rich hunting ground for Ospreys and other fish-eating birds. I hope that the work we plan to do with schools in the Gambia will, in its own small way, encourage the next generation of Gambians to take an interest in the natural world and, in doing so, help to protect and conserve the wonderful array of birds that their country has become famous for. After one last visit to Tanji marsh at first light on Tuesday morning, we said goodbye to the staff at the Paradise Inn Lodge who had been so helpful and friendly, and made our way to the airport. Sitting there we had time to reflect on an unforgettable trip. We’d seen hundreds of Ospreys, over 270 other bird species and identified 22 different colour-ringed Ospreys, all within a few kilometres of this beautiful coastline. Of the colour-ringed Ospreys, 13 were German, seven Scottish, one French and one English. We have lots of exciting plans for future work in Gambia and we’ll be reporting on them on the website soon. In the meantime I would like to thank JJ and Frederick, our two guides, who have enhanced the trip enormously. 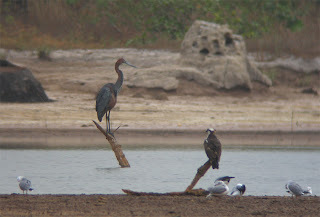 Be sure to check out their respective websites www.gambiabirdguide.com and ornithondar.blogspot.com. 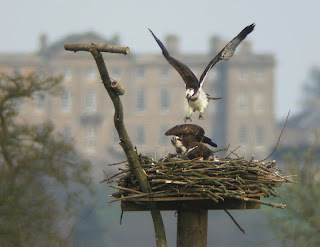 Finally, watch out for the final video diaries on our youtube channel www.youtube.com/rutlandospreys. Just heard from Tim. The internet connection has gone down so news of the second week in Senegal may not be posted until Wednesday when Tim, John and Paul are back in the UK. There is one bit of news though, the team today found one of the 2007 Lake District birds at Djoudj with a white/black ring YU. So close to being one of our Rutland birds. Here are a great selection of photos from week one courtesy of Osprey volunteer Lorna Burger. On Thursday morning we headed south towards Gunjur and Kartong. Paul Stammers had been asked by a friend to look up Colin Cross, who now runs the Kartong Bird Observatory. They made contact during Week 1 and JJ realised that it was an excellent place for birdwatching. 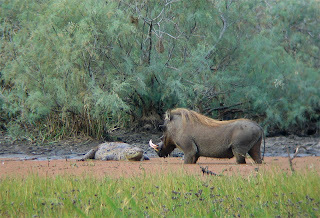 Group 1 carried on with their original itinerary, but it was decided that Group 2 would visit this reserve – good decision. Colin met us along with his two dogs and we started out on our tour. We saw so many different species of birds including White-faced Whistling Ducks, Black Crake, African Hobby, Rufus Crowned Roller and Liz Jameson’s favourite of the trip, an African Harrier-Hawk with an amazing fluorescent bubble-gum pink face. It almost goes without saying that we saw Ospreys too! One juvenile came to bathe very close to our left (photo) whilst to our right we watched in awe of a crocodile – mouth wide open showing his teeth. As we wandered on, Colin showed us where he had found a crocodile’s nest (!) 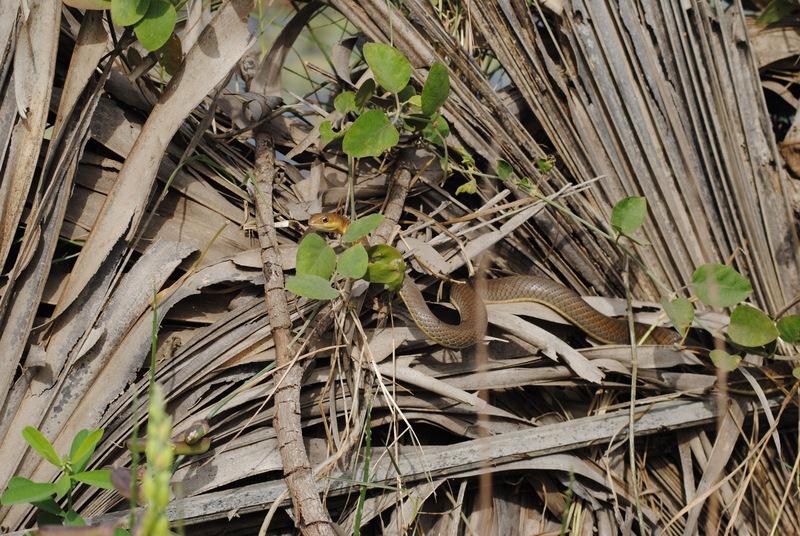 and then on the fence, not a metre away, an Olive Sand Snake watched us walk by (see photo). We arrived back at Colin’s house and gathered on the veranda where he explained about a charity which he has set up. Colin is a retired schoolteacher and moved out to The Gambia a year ago. He gives money to parents of sick children to pay for visits to a doctor. If medicine is required, he gives them money upon receipt of the prescription and asks to see the drugs as proof. It was the 20th January and he had already received over 100 requests this year; we were all happy to make a donation. We carried on to Kartong beach (Week 2 Video Diary Kartong Beach) and watched Ospreys fishing. We were really hoping to spot the Lake District juvenile, No.12, who fledged last summer and is satellite-tagged. Sadly, we didn’t catch up with him but I’m sure the photos that Tim will be sending to Pete Davies of that Project, illustrating where he is fishing regularly, will cheer them up, especially after the loss earlier this month of his sibling, No.11, in Northern Senegal. As Tim has mentioned, quite a few ringed Ospreys have been identified by our team; mainly German birds but also a French one and several Scottish ones. They must all be pleased to learn that their birds are alive, I know Roy Dennis has confirmed that some of the Scottish birds spotted were ringed by him, comforting news for him to receive. On Monday we returned from Senegal on the Barra-Banjul ferry; I had read that these ferry crossings were not for the faint-hearted, they were not wrong. Once we were off the ferry we took an hour to look around Banjul market, busy, bustling and full of smiling faces as ever. As a keen cook, I asked JJ if he would show me the Fish Market. Whilst he was deciding which direction to take, we were approached by a lovely Gambian lady who offered to show around. The fish were amazing and it was interesting to see the Butter fish and Lady fish which we had been eating regularly. We also saw Needle fish which we hadn’t eaten, but on the last morning on Tanji Beach an Osprey caught one and flew right over our heads with it. We ate very well throughout the week and one memorable lunch after we had visited Colin was a national dish – Domoda – Gambian Ground Peanut Stew – definitely will be trying that at home. The lady who showed us around the market eventually led us back to her own stall. It actually turned out that she used to live in Hackney and had friends in Leicester – what a small world. She had a beautiful baby daughter just two weeks old and only weighing 1.5kg at birth. Whilst she was helping Paul to decide on a colourful shirt, I cradled the baby (family photo). 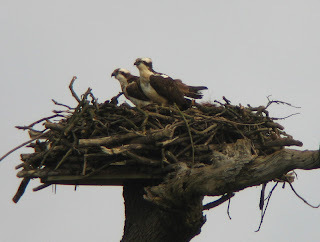 On day one we had seen 3 Ospreys from the bus on the short journey to The Paradise Inn. On arrival there, I immediately left my bags in my ‘hut’ and wandered a mere 30 yards to the creek. There, with Vikki and Liz, an Osprey carrying a fish, flew right over our heads. 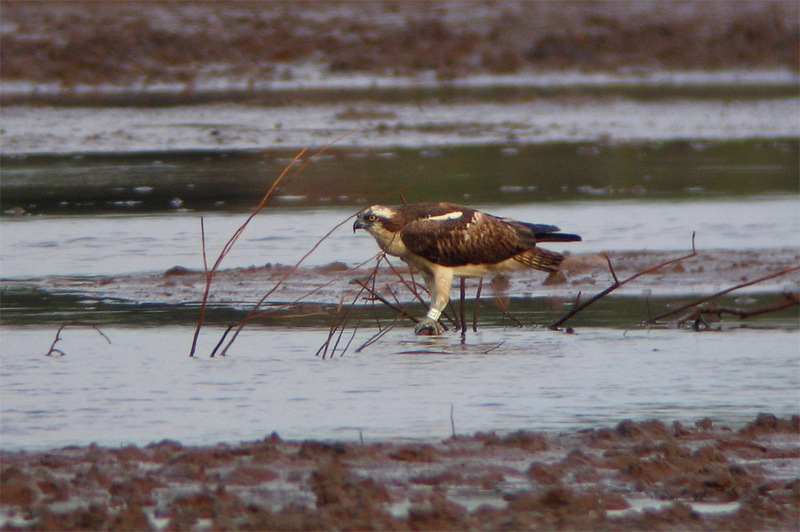 That was the beginning of a wonderful week – an abundance of Ospreys every day including our last morning. I made an interesting discovery on that last morning – I discovered how John manages to stay one step ahead of the rest of us to obtain the best photos (see above photo). 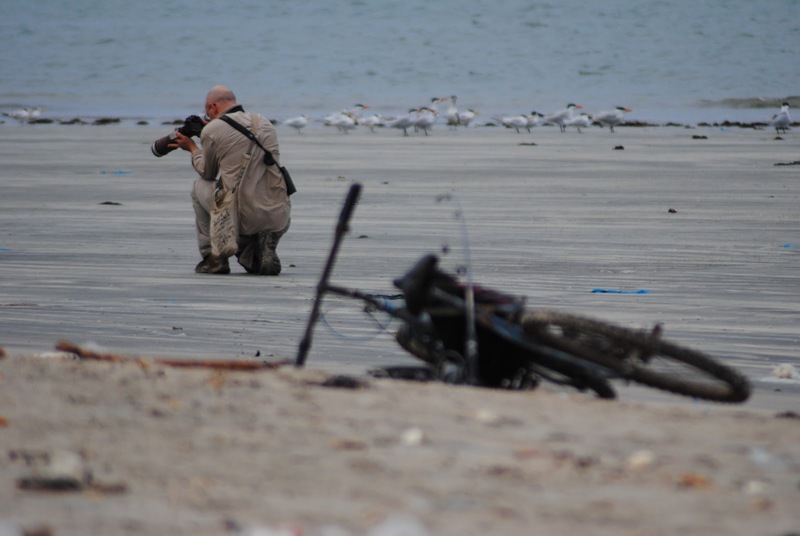 We are all really looking forward to seeing his photos and to hear their tales of Northern Senegal. It was an amazing trip and I long to return. It’s now 12 days since I returned from Gambia having been part of the first group of volunteers to travel to West Africa in search of wintering Ospreys. Just reading the updates, watching the videos and looking at the photographs from the second week together with Tim’s first report from Northern Senegal only serves to remind me what a special place Africa is. After two hours of the flight over to Banjul we had already cleared the Southern coast of Spain, the pilot even dipped his wing to give us a clear view of the Rock of Gibraltar. It struck me at this point just what a mammoth journey our young Ospreys have to undertake given we still had four more hours to travel and we saw nothing but sand for most of the remainder of the flight. Its little wonder that only a fraction of the birds that fledge make it back to the UK to breed. This was my first travel experience outside of Europe and I have to admit I wasn’t really prepared for what would greet us in Gambia, the sights, the sounds and even the smells (particularly when driving past the fish gutting and smoking huts) were overwhelming. 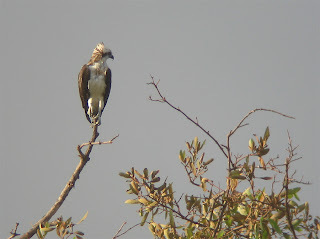 We got a taste of what the trip would be like however when within twenty minutes of leaving the airport on our journey to Tanji we had seen our first Osprey. 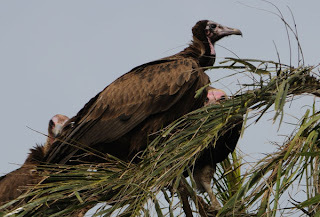 The sky was full of Hooded Vultures and Black Kites and all around us we were beginning to see the real Africa. On reaching our accommodation again it was a shock to me driving down rough dirt roads through Tanji village to reach the Paradise Inn Lodge. On that drive though all the children were screaming and waving at us expecting nothing more in return than a wave back. The second day saw us taking a boat trip to Bijoli Island, the boat was late and JJ, our brilliant guide, was not happy, eventually the boat turned up complete with a huge fishing net stored in the middle of it. The realisation then set in that we would be wading out to meet it, all part of the fun and charm of the place though. On the way over to the island I got talking to the boat owner and he was keen to turn the conversation to football, it turns out he was a huge Manchester United fan and the boat was named Michael Carrick, his previous one was called Wes Brown apparently, as a lifelong Liverpool fan I did consider swimming back to the shore but felt that was possibly a little over the top. The island was a very special place, we saw at least two Ospreys catching fish and several others perched or flying past, it was here though that I got my first ever views of Caspian Terns, a real treat with their huge Orange bills. After a couple of hours we headed back, everywhere you go the locals will come and great you and take an interest in you, one of them however took more interest than the others. A local character, ironically called “Happy Happy”, turned out not to be too happy and entered into a heated discussion with JJ over our rights to visit the island. The third day saw us visit Gunjur Beach in the morning, a beautiful spot, then onto Kartong for lunch and a boat trip through the Mangroves. During lunch at Kartong we got an idea what difference tourism makes to these villages when the manager explained to us how the place operated and how the profits were invested back into the local community. The boat trip was fantastic, Ospreys were everywhere and we got sight of a couple with coloured rings. A Goliath heron, numerous kingfishers, bee-eaters, a palm vulture and a fish eagle were among the numerous other species we saw. Day four saw us head to Senegal, we got a real taste of Africa in seeing the operation of the Banjul to Barra ferry, heaven knows what would have happened if we hadn’t had JJ and Eladji to get us on the ferry, my abiding memory here was being stood on the top deck of the ferry with Tim waiting to depart when the doors opened in the terminal and what can only be described as a Tidal Wave of foot passengers boarded the ferry. We got to the other side and after a stop at the border we headed into Senegal. Having left the apprehension well behind and become accustomed to the Paradise Inn and the wonderful people who worked there it felt like we were almost being cheated of the African experience at the Keur Saloum hotel in Senegal as it is quite luxurious. Day five was the highlight for me, a five hour boat trip into the mouth of the Sine Saloum delta, none of us knew what to expect but seeing 35+ Ospreys including at one time eleven perched within a 200m stretch of sand bar was incredible. We even found one with a coloured ring and Tim knee deep in water was able to read the ring number, it will be interesting when the guys get back from Senegal to find out exactly where all the colour ringed Ospreys found during the four weeks emanate from. Day six saw us venture further into Senegal up to Kaolack, new species were added to the list and it was on the way back we had a real treat, having stopped at a small wetland area we were preparing to leave when Eladji, our driver for the week, heard an owl, JJ was on to it and before too long we were looking at a pair of Verreaux’s Eagle Owls perched high up in a large tree, what a treat! There’s even a video of a scruffy fella talking about it on our YouTube channel. Day Seven dawned and we prepared to leave Senegal and head back to the Paradise Inn for our last night, it was dawning on me that our time in Gambia and Senegal was drawing to a close and that a week just isn’t long enough to do it justice. We got back to the Paradise Inn to be greeted like long lost relatives by the guys there, Mohammed, Yaro, Abdouli and Ibrahim were all there waiting for us. 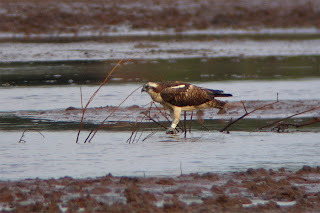 The evening saw us venture out a short distance from the lodge to find another wetland area where we saw six ospreys perched, another ring was able to be read, we headed back as it was getting dark only to see a Crested Eagle on the way. 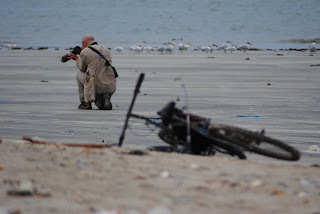 A trip to Tanji beach early on the last morning gave us a final chance to watch Ospreys fishing in the sea. Attached below is what is admittedly a very poor photo of an Osprey we observed catching the biggest fish I have seen an Osprey carry. A nice open air lunch under a Mango tree at the Paradise Inn was our final taste of Gambia, shortly after we headed off to the airport to catch our flight home. The Ospreys will stick long in the memory but what will also stick are the warmth of the people we met, the smiles on the faces of the children we saw, not forgetting JJ, our fantastic guide who I cannot recommend highly enough. Just sitting with new friends during the heat of the day drinking Coke from glass bottles was a real treat as well. If you’ve never been to Africa and you get the chance then go, you won’t regret it; I for one cannot wait to go back next year. It is a long way from Tanji to St Louis. It took us fourteen hours to drive the 450 or so kilometres from south of the Gambia River to within touching distance of Mauritania. 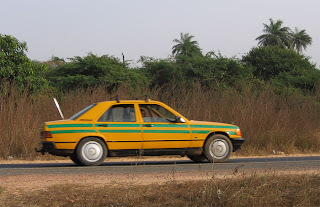 After waving goodbye to the second group of project volunteers at Banjul airport on Tuesday afternoon, John, Paul and myself had just one more evening in Tanji before setting out on the long drive to northern Senegal, well before dawn on Wednesday morning. 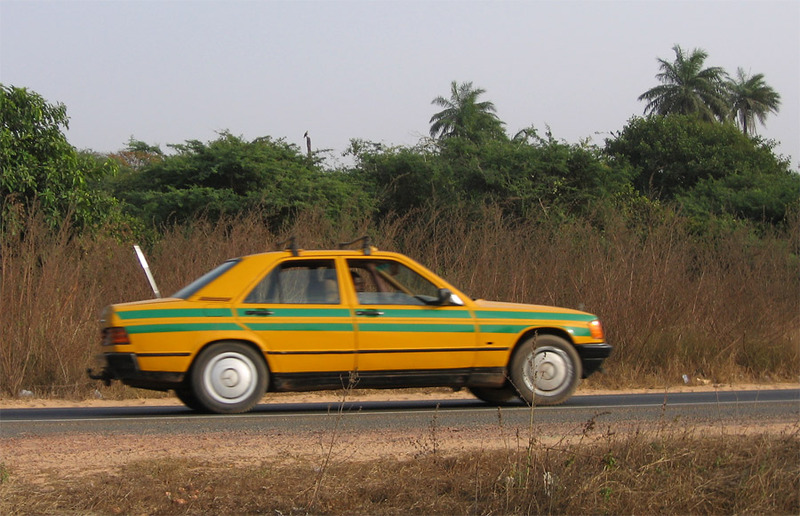 I say drive, a good proportion of the journey was actually spent waiting, for what seemed like an eternity, for the Banjul-Barra ferry and then engulfed in bureaucracy at the Gambia-Senegal border crossing. However, once in Senegal our progress was much quicker, and the journey, fantastic. Rather than driving up the west coast of Senegal, we crossed through the arid centre of the country, passing through Kaolack, Touba and Diorbel; all towns well off the usual tourist trail. lappet-faced vultures and chestnut-bellied starlings served to improve the journey yet further. We eventually arrive at St Louis shortly before 7pm. We’re staying in Bango a small village on the shores of the Lampsar river with Frederic Bacuez, a French birdwatcher who has been living in the St Louis area for the past six years. Frederic knows the northern part of Senegal very well and even has a pair of ospreys that catch fish within sight of his house every day. Having seen so many ospreys in Gambia and the Sine-Saloum delta we were not really sure what to expect of northern Senegal. Yes, ospreys winter in this region, but surely they wouldn’t be present in the same densities as further south? Our osprey tally for the first two weeks was well into three figures, but more significantly, we had managed to read twelve colour rings. How many more could we expect in the north? Well, if the first full day birdwatching is anything to go by, we aren’t going to struggle to see more. Yesterday we spent an unforgettable day at Djoudj National Park. 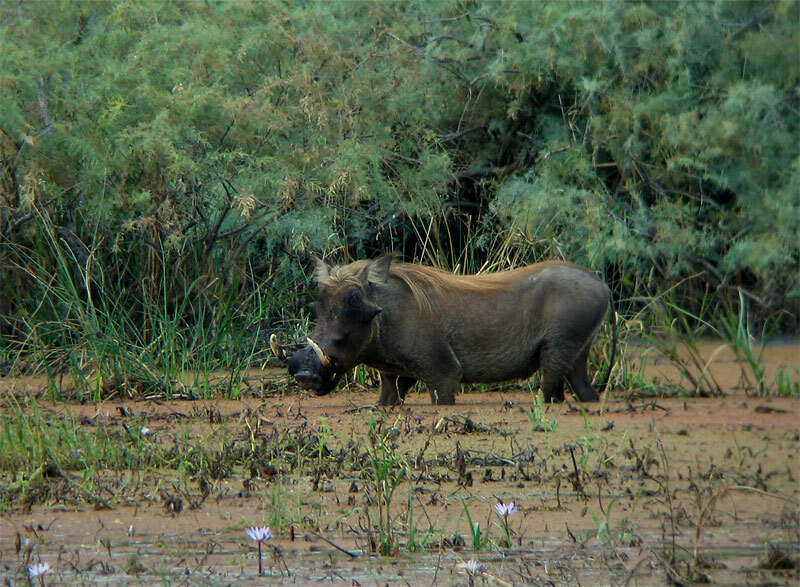 Djoudj is the most northerly national park in Senegal and extends over some 40,000 acres. The park was created in 1971 and designated a UNESCO World Heritage Site ten years later. It’s not hard to see why; the shallow water and marsh make it a Mecca for migrating birds. As many as three million palearctic migrants either pass through or winter here each year. Among them are, of course, Ospreys. One of the real highlights of the trip thus far for me, has been seeing so many of the UK’s summer visitors in a very different context. It is one thing to see yellow wagtails feeding amongst dexter cattle at Rutland Water, but quite another to see them flitting past warthogs and crocodiles. 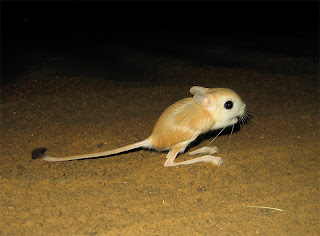 That though, it exactly what we saw at Djoudj. 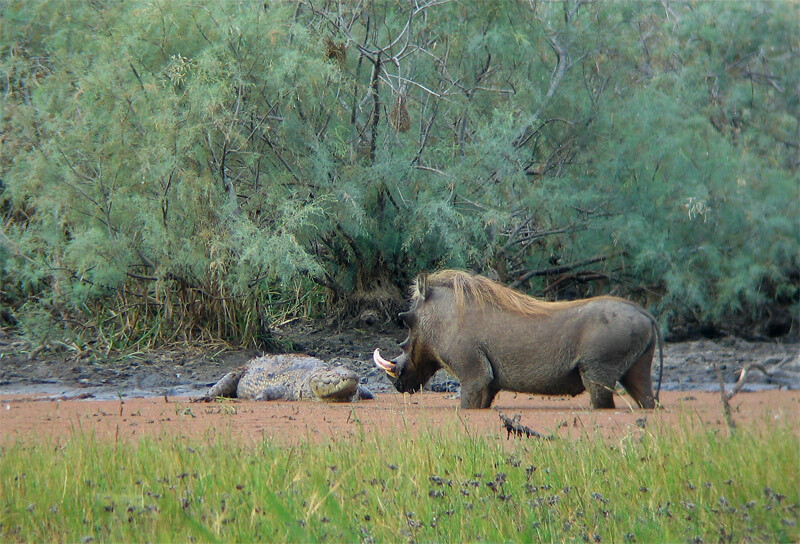 And it wasn’t just crocodile and warthogs. Numerous jackels roam the park, white-faced whistling ducks congregate in their thousands and more than 5000 pairs of pelicans breed. Everywhere we looked we were met by a real spectacle, whether it be a huge flock of garganey or groups of white-winged black and whiskered terns following our boat. As the day progressed I began to run out of superlatives. And amongst all of this lot, there were ospreys. 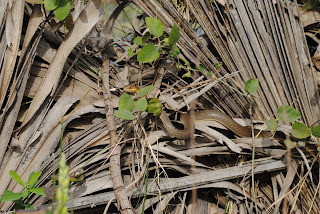 Over the course of the day we saw between 15 and 20 different individuals. Nearly all were unringed, but we did manage to read two more German colour rings. One of them, an adult female, went a long way to disproving an observation I made in my last blog post. 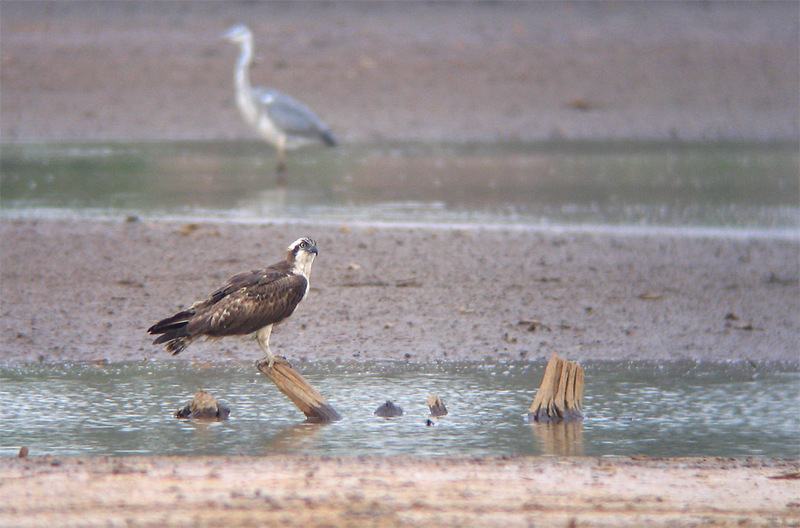 All through the trip we have seen adult ospreys stamping their authority on the latest influx of juveniles. Some established adults will have been returning to the same wintering site for a decade or more. As such they have little time for a juvenile who is looking to pinch their fish. I just presumed that most juveniles take the hint and move on elsewhere in search of a site they can call their winter home. At Djoudj however we saw quite the opposite. For more than an hour on Friday evening we watched a juvenile male chase and harry the German female. Whenever she landed, the youngster gave chase, pursuing her above the flocks of feeding spoobills and egrets as if he owned the place. I guess some juvenile’s are just more up for a fight than others. From top: volunteers at Tanji school with John's Osprey drawing on the blackboard behind, showing the school children photos of themselves and Tim Mackrill teaching a class about Ospreys at Tanji school. Tim, John and Paul have travelled up to Northern Senegal and Tim has invited me to write a little about the trip from a volunteer’s point of view. The second group of volunteers said goodbye to them on Tuesday afternoon to fly home and yesterday they were departing the Paradise Inn in The Gambia to travel over the border into Senegal and drive North almost to the Mauritanian border on the bumpy Kaolack road so aptly described by Chris in the YouTube Video Diary No. 4. This time they were travelling without JJ, our wonderful guide, but in a 4 x 4 with a driver, it will have been a very long day for them and I certainly don’t envy the border crossing – with JJ we didn’t have to step off the bus so it will be interesting to see how they fared without him. One of the highlights of the second week was a visit to Tanji School, with 1200 pupils, 600 attending in the morning, and 600 in the afternoon. All education in Gambia is paid for privately, with the aid of their parents, these children are fortunate. Throughout our travels on the bus we were always greeted by lots of children running from the dusty areas in front of their village and town huts, they waved frantically at us calling ‘hello’ and were overjoyed by a return wave from us. We were not disappointed when our bus pulled into the dusty playground of the school. Most were dressed in the blue and white uniform and as they eagerly gathered around us it was a joy to see their smiling faces. We were introduced to some of the teachers and a group of children was selected to fill one of the classrooms to listen to what Tim had to say about Ospreys. To illustrate his talk he used his laptop and book ‘Birds of The Gambia and Senegal’, which he promptly presented to the Headteacher afterwards. Whilst Tim was speaking, John was drawing an Osprey on the blackboard – the children watched on in awe, as too did we. I would imagine that drawing is still on the blackboard. Other children were clamouring at the doorway next to me and also at the open brick windows, but as much as they pushed and pulled they were extremely polite to us. Once Tim had finished talking we started taking photos of the children and the excitement and wonderment of seeing themselves in the photos was a joy to see, they pointed at the photo and giggled with each other, such a simple pleasure. I know Tim will be working hard to establish that link between Tanji School and one of ours and things have already been set in motion to raise money for those happy smiling schoolchildren. As far as the birds are concerned, I’m going to leave that to the experts, who will be reporting on their return, unless they can get wifi whilst on their travels. I will say, however, that there seemed to be a certain element of lighthearted competition between Week 1 and Week 2 as to who could see the most species. Well, let’s just say that as a volunteer from Week 2 my smile is as broad as any that I witnessed from the lovely people of The Gambia! I shall not mention any numbers but Paul carried his notebook everywhere and studiously recorded them all. These figures and names were handed to Liz Jameson, Project Information Officer, who will be typing them up for us all – it was almost like the Olympic Flame being handed over. One more thing before I sign off. Three of the volunteers visited Isle des Oiseaux (Island of the Birds) with the rest of the team. Sadly the rest of the volunteers decided not to come along because of the journey itself. It was a long journey; breakfasting at 5.30am, travelling by bus in darkness to Missira, in the Sine Saloum delta to get in a fishing boat to take us out to the island. It was a distance of 16km but avoiding the mud flats more like 20km – 1hr 45mins. The sea was quite choppy and some of us got soaked. We waded from the boat to shore on arrival at the island. We were the first people to set foot on the island since Simon King’s visit last year and we felt very very privileged. Words are going to be totally inadequate to describe what awaited us. The first week Tim said he could see 11 birds on the tapering sandbar at the end of the island but George and I counted 14 this week. I could see 6 Ospreys in my binoculars without moving! We were very close as they fished right in front of us, taking their catch back to the sandbar. This was really what I had come to see; Ospreys in their wintering quarters and nothing could have prepared me for the spectacle unfolding so closely. 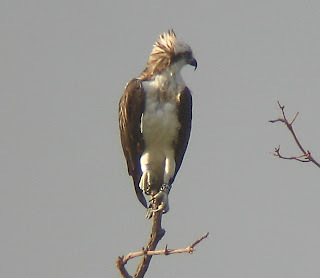 There is no doubt that if you spend four weeks in West Africa in January that you will see lots of Ospreys. I knew this before we flew to Banjul last week, but I really wasn’t expecting to see them in the numbers that we have done during the first ten days of the trip. By the end of the first week our tally numbered over one hundred individual birds, and we have added to that quite considerably after a few more days in the south of Gambia. This week we are returning to the various sites we visited during the first eight days of the trip, this time with a second group of project volunteers. It was sad to wave goodbye to the first group at Banjul airport on Tuesday afternoon, but great to welcome the second group a couple of hours later. Aside from the sheer number of Ospreys, it has been a real privilege and extremely interesting to watch the birds’ behaviour on their wintering grounds. Something that has really surprised me, is that the adults birds are generally very tolerant of each other. The best example of this was at the Sine-Saloum Delta in Senegal last week when we saw 11 different Ospreys perched within a couple of hundred metres of each other. Thinking about it though, maybe I shouldn’t be surprised at all – remember, these birds will all know each other. Satellite tracking and other studies have shown that Ospreys return to the same wintering site every year; sometimes for more than twenty years. So if the same birds are returning to the same site each year, they must recognise each other. As long as there is plenty of fish, there is no need to waste energy chasing off a bird that you have seen every winter for the past ten or so years. Having said that, things are very different if an unknown juvenile appears. While one adult bird will let another pass directly over head without flinching, it is a totally different story if the bird flying over is a juvenile. In this case the adult bird will usually give a ‘chip’ call to warn off the juvenile, and if it doesn’t get the message, it will give chase. We have seen this behaviour over and over again in the past week and so there is clearly a hierarchy at all wintering sites. If you’re an established bird, then no problem. If, on the other hand, you are a juvenile who has arrived in West Africa for the first time then, good luck. 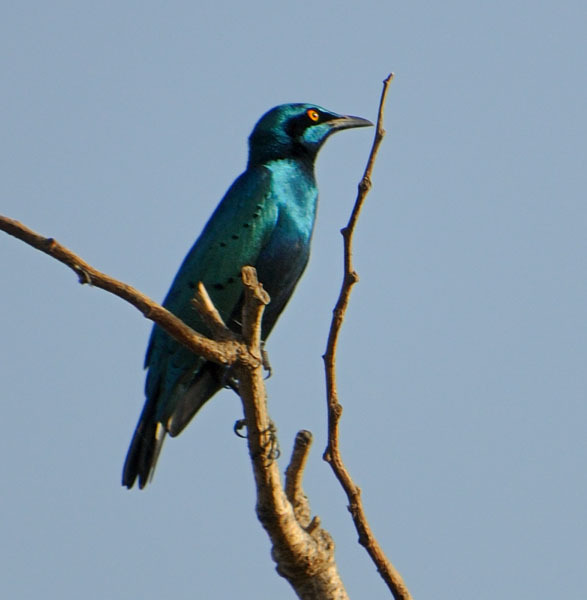 This of course explains why the juvenile birds wander so widely during their first six months in Africa; they are looking for somewhere rich in food, but also where they will be accepted by the locals! Another very interesting aspect of wintering behaviour that we have witnessed during the first ten days, is the differing ability of adult and juvenile birds to catch fish. 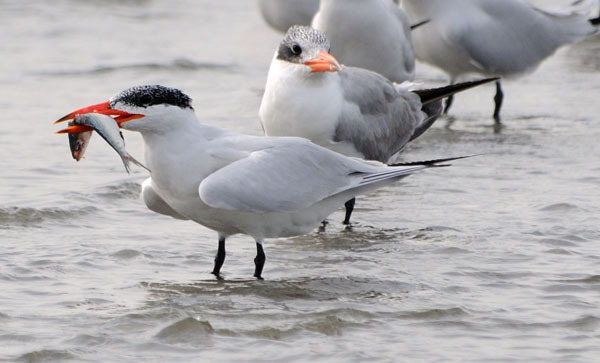 In places where fish are abundant, such as the Sine-Saloum delta, and the coastline of Gambia south of Banjul, adult birds have very little difficulty when out hunting – most catch a meal within minutes. For juveniles though, it is a very different story. 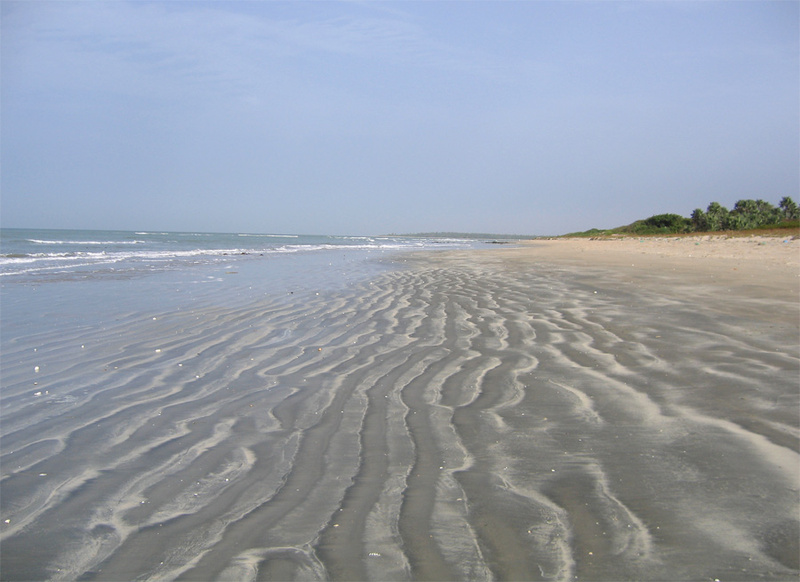 On Wednesday afternoon this week we visited Bajoli Island, situated about two miles off the Gambian coast at Tanji. 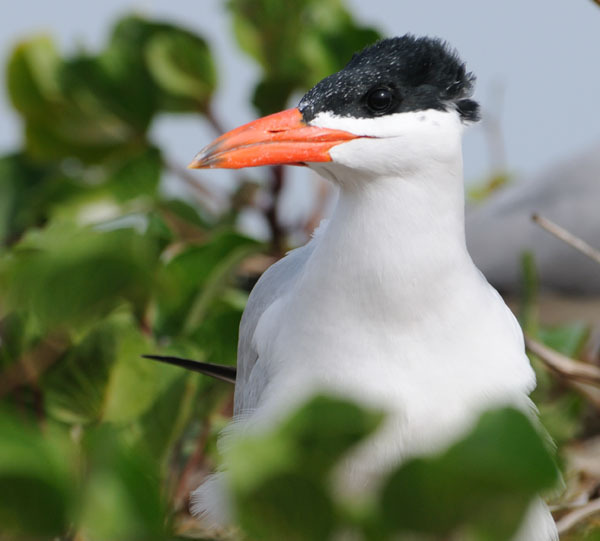 This small sandy island is home to a huge colony of nesting Caspian Terns and Grey-headed Gulls and numerous wintering Ospreys. 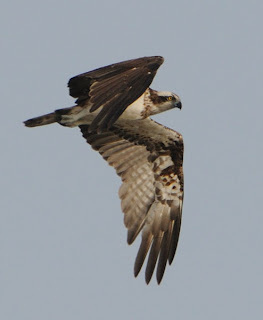 During a two hour visit we saw somewhere in the region of 10-15 different Ospreys, several of them juveniles. If the amount of fish brought back to Tanji every day by the local fishermen is anything to go by, the sea here is teeming with fish, thereby providing rich pickings for a hungry Osprey. You wouldn’t have known it though if you just watched the young Ospreys. Time after time, they hit the water but failed to come up with a fish. One particular bird must have crashed into the water on more than a dozen occasions before it finally came up with a fish. And by the time it eventually dragged a fish out of the water, it was so exhausted that it didn’t have the energy to eat it; instead it just flopped down onto the beach and sat there, exhausted. 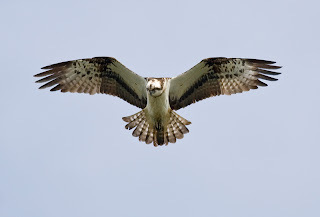 The sad reality is that this clearly demonstrates that surviving their first migration does not guarantee that a young Ospreys will survive to adulthood. It takes time for the birds to refine their fishing technique – and those that do not do this quick enough, probably don’t make it. A very clear example of natural selection in action. Before our boat trip to Bijoli Island on Wednesday, we visited a primary school in Tanji, a fishing town of some 15,000 people a few kilometres south of Banjul. As I said in the blog last week, one of the main aims of our trip is to establish links with people in West Africa, and it seemed that a school was a good place to start. More than 1200 children aged 5-14 attend Tanji school. Significantly, all live within a couple of miles of a coast where numerous Ospreys catch fish every day during the winter. During our visit I gave a talk to 30 or so pupils about our work at Rutland Water in an effort to try and emphasise how special these birds really are. The kids all seemed genuinely interested. I’m not sure how many of them knew what an Osprey was before the visit, but they certainly do now! We now plan to link Tanji school with a primary school in Rutland to allow the children to write and keep in touch with each other, with Ospreys as the link cementing their relationship. Among the numerous Ospreys we’ve seen since my last update, several have been colour ringed. Of these, we managed to read five of them. Four of the birds were German and one, French. It will be really interesting to find out a bit more about each bird and specifically to see how many winters they have spent in West Africa. I will of course report any news on the blog. Roy Dennis got back to me last week to say that the Scottish juvenile we saw at Sine-Saloum was ringed at a nest in central Scotland. I wonder if the neighbouring adult birds will allow it to make the mouth of the River Saloum its regular winter home? Finally I must mention our guide, JJ. 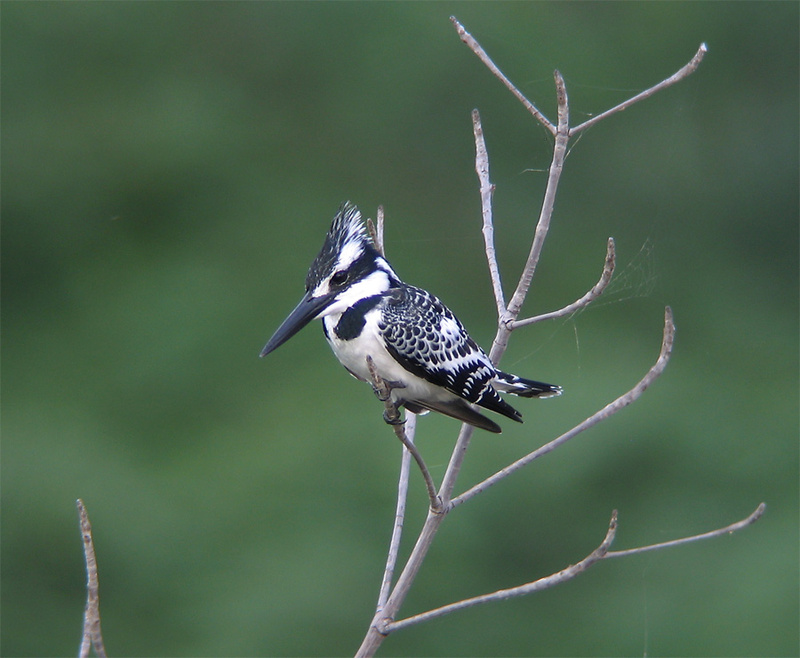 JJ has been leading bird tours in the Gambia and Senegal for many years, but I don’t think he’s ever lead two groups quite like us. 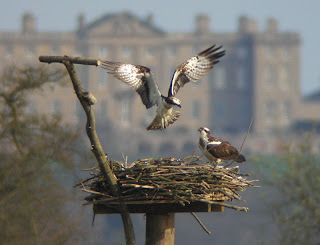 Of course he knew about Ospreys before, but he certainly knows a lot more now! If you are planning a trip to the Gambia or Senegal then I would urge you to get in touch with JJ; he is extremely knowledgeable, enthusiastic and good fun to be with. He also now knows a fair bit about wintering Ospreys. 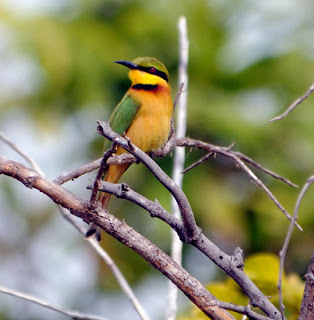 Check out his website www.gambiabirdguide.com. 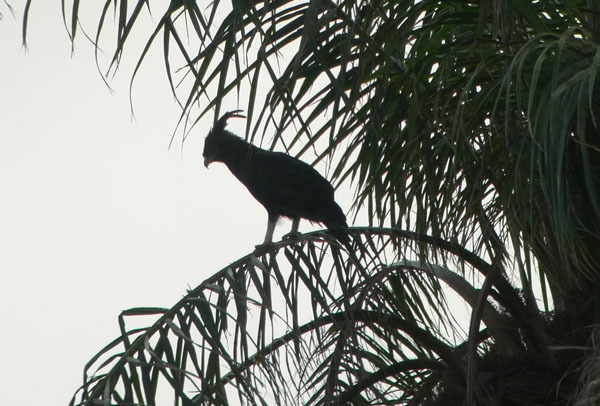 Your trip to the Gambia wouldn’t be complete without him. I’ll post another blog next week, but in the meantime we’ll add some more photos over the next couple of days. Make sure you also watch out for some video diaries on the project’s youtube channel too. 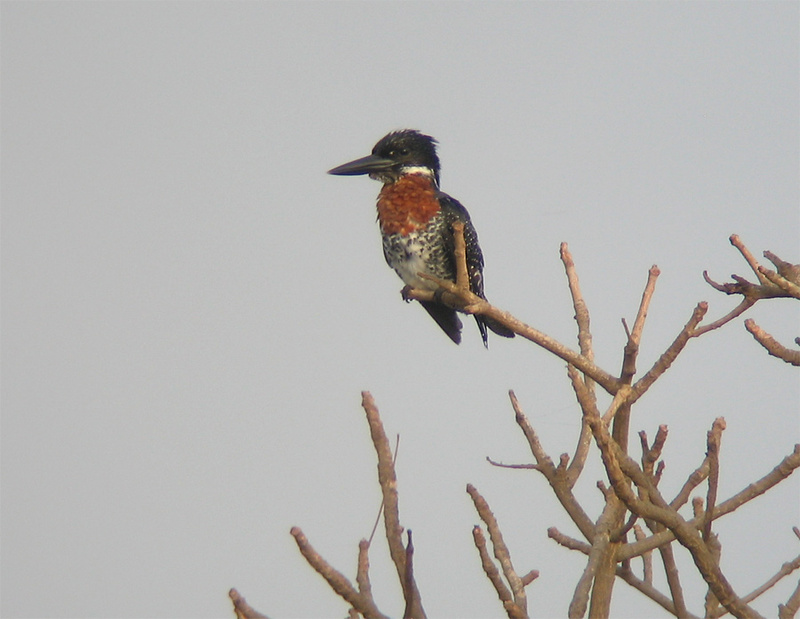 Pied Kingfisher, Giant Kingfisher and African Fish Eagle. When you spend all summer watching Ospreys every day, the prospect of seeing them on their wintering grounds in tropical West Africa is incredibly exciting. The thought of doing so for four weeks is even better. Imagine our excitement therefore, when myself John Wright, Paul Stammers and 11 Osprey Project volunteers boarded a plane for Banjul on Tuesday. John, Paul and I are spending a month in Gambia and Senegal, and the volunteer group are with us for our first week. The trip has two main aims; firstly to establish links with people in West Africa, and secondly, to look for colour-ringed Ospreys. Of course the chances of us finding a Rutland Water Osprey in West Africa are pretty remote; the proverbial needle in a haystack. However, the coast of Gambia and Senegal is an incredibly important wintering area for Ospreys from Sweden, Germany, France, and of course, the UK, so there is no doubt that we stand a good chance of finding a good number of colour-ringed birds. If we found one from Rutland Water it would just be the (admittedly very good) icing on the cake. Our week started with two days in southern Gambia; off the usual tourist trail between Tanji and the southern border with Senegal. This stretch of coastline is everything that you would imagine tropical West Africa to be – seemingly never ending stretches of beautiful sandy beaches bordered by palm trees and interspersed with bustling fishing villages, Tanji foremost among them. It is also a very welcoming place. If there is one word to describe the people of Gambia, it is friendly. Most of the people we encountered along this coastline live in extremely basic conditions, but this does not stop them greeting you with a smile. 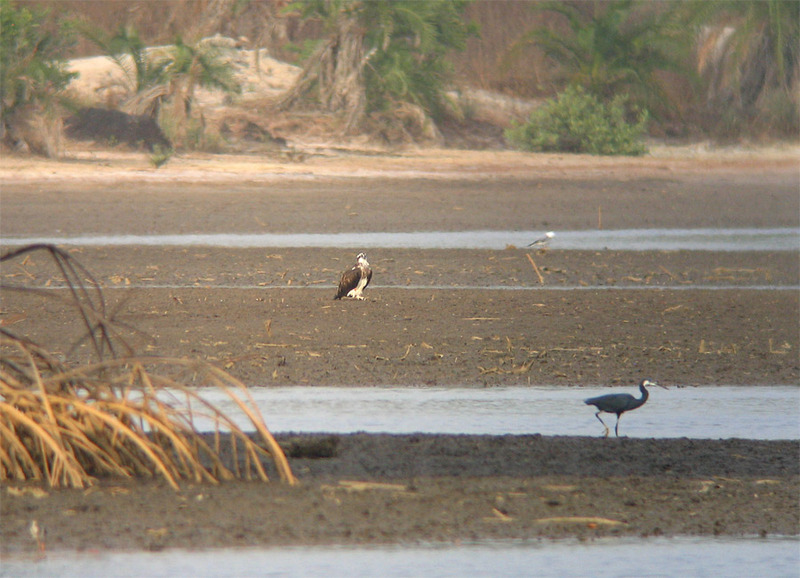 Of the thirty or so Ospreys we saw on the first three days of the trip, at least six were colour ringed. Happily we succeeded in reading one of them; a German ring - black 5GZ. I have emailed Daniel Schmidt to find out where this (adult male) bird, who we came across at a small wetland on the edge of Banjul, heralds from. Three of the remaining birds also had black rings; two of which John photographed in flight and the third, a female, flew off before we were close enough to read the ring. Frustratingly, an orange-ringed bird (probably French) also took flight as we approached it by boat through mangroves bordering the River Allahein. Had we been on dry land I would have been able to read the ring, but a rocking boat made looking through my scope not only difficult, but quite sickly! Fortunately we are returning to the sites where we saw these latter two birds, next week; perhaps we will get another chance to identify them? Most Ospreys remain faithful to the same wintering site all winter, so there is a good chance we’ll see these two individuals again. Hopefully the same will be true of a blue-ringed bird we found just north of Kartong. One Osprey we sadly didn’t see is the Lake District juvenile who is wintering in the southern part of the Gambia. Pete Davies from the Lake District project kindly sent me the latest GPS positions of the bird earlier in the week. We visited the area it has been frequenting; a beautiful unspoilt section of coast between Gunjur and Kartong on Wednesday morning. During a walk along the beach we saw at least three different adult Ospreys (one of them a black-ringed – probably German – female), but sadly, not number 12. 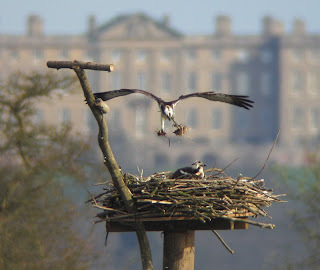 We will however upload a short video clip of the site onto the Rutland Ospreys youtube channel. To say it would be a pleasant area to spend the winter, would be an understatement! Watch out for the video to see what I mean – hopefully it will be on youtube by the end of next week. After two full days on the Gambian coast we drove north and crossed the Gambia River by car ferry from Banjul. That in itself was an unforgettable experience – chaotic, but at the same time full of all the vibrancy Gambia is famous for. We then continued north into Senegal, to spend three days at one of the most important wetland sites in West Africa, the immense Sine-Saloum delta. 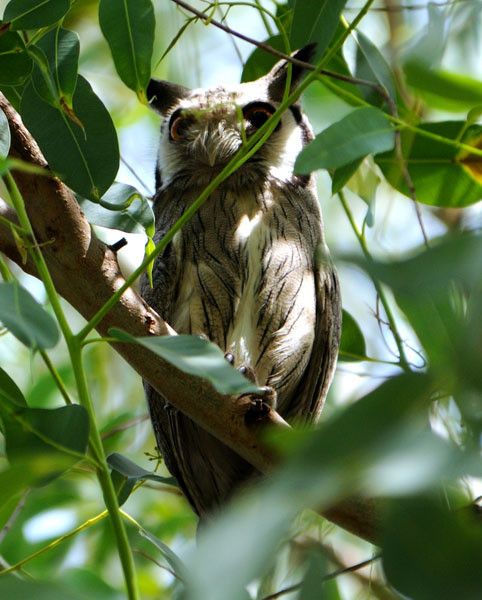 This vast area of mangrove swamp and river delta is home to a vast array of bird life, including somewhere in the region of 500 Ospreys each winter. On Saturday morning we were up well before dawn in order to get to the village of Missirah as soon after first light as possible. JJ, our guide, had chartered a fishing boat to take us out to the mouth of the Saloum delta. Here we expected to see fishing Ospreys. Nothing though could have prepared us for what was an unforgettable few hours. After slowly meandering our way through the mangroves we arrived at the mouth of the river. Here the shallow water and abundant fish stocks clearly provide a rich fishing grounds for hungry Ospreys. 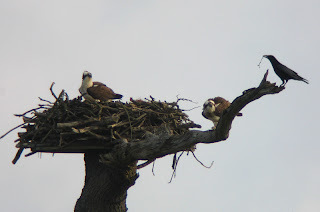 And when I say Ospreys, I really do mean Ospreys. On one particular sand bar we counted 11 different birds, all perched within a few hundred metres of each other; four of them on the same branch. To say I was overawed would be an understatement. It was truly unforgettable experience. During the course of the morning we think we saw in the region of 35-40 different Ospreys – several of which caught fish within sight of the boat. Excitingly one of them was Scottish-ringed juvenile, blue/white SL. Roy Dennis sent a text today to say that this Osprey fledged from a nest in central Scotland last summer. 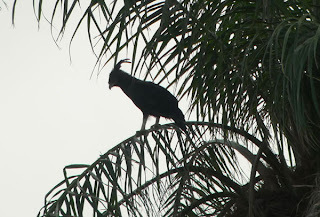 Of course we have also seen a selection of the vast array of other birds Gambia and Senegal are famous for – and we’ll post a few of John and Chris Ditchburn’s photos on the blog as soon as possible. Tomorrow we’re heading back to Gambia. 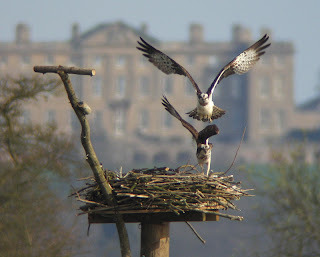 I wonder if a Rutland Osprey will be waiting to greet us? Watch out for another blog update same time next week. 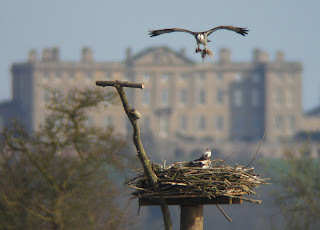 The Rutland Ospreys website is now back up and running, so please check www.ospreys.org.uk for the latest news. Following the incredible battle between 5N and the unringed female on Friday afternoon, normal service has been resumed in Manton Bay. 5N made one brief return on Saturday afternoon, but was immediately chased off by both 5R and his mate. They were obviously determined that there was going to be no repeat of Friday and, since then, things have become more settled. 5R has caught at least two fish each day for the past three days, and the pair have been copulating regularly. More good news is that we are hoping to have the website back up and running by Wednesday afternoon. Don't forget you can get great views of the Manton Bay nest by visiting the Lyndon reserve - signposted off the minor road between Manton and Edith Weston on the south shore of Rutland Water. Having arrived at the Manton Bay nest on Tuesday morning, the unringed female had appeared very settled. 5R had provided her with a regular supply of fish and the birds were copulating regularly. All seemed very promising. But then 5N turned up. Just before 2pm yesterday afternoon 5N - who bred at the nest in 2007 and 2008 before moving to Site N last year - appeared over the nest and dive bombed 5R and the female, forcing them both to take to the air. For the next half hour 5N continued to bombard her brother and his mate. Each time either bird landed on the nest they were dive-bombed by 5N. Following 08's return on 31st March, she has appeared very settled at Site N, but the sight of a female on her old nest was obviously too much for her to take. Eventually 5R did manage to return to the nest. However the battle between his mate and 5N showed no sign of relenting. By now the unringed female had turned the tables, and was attempting to drive 5N away from the nest and displaying above her. 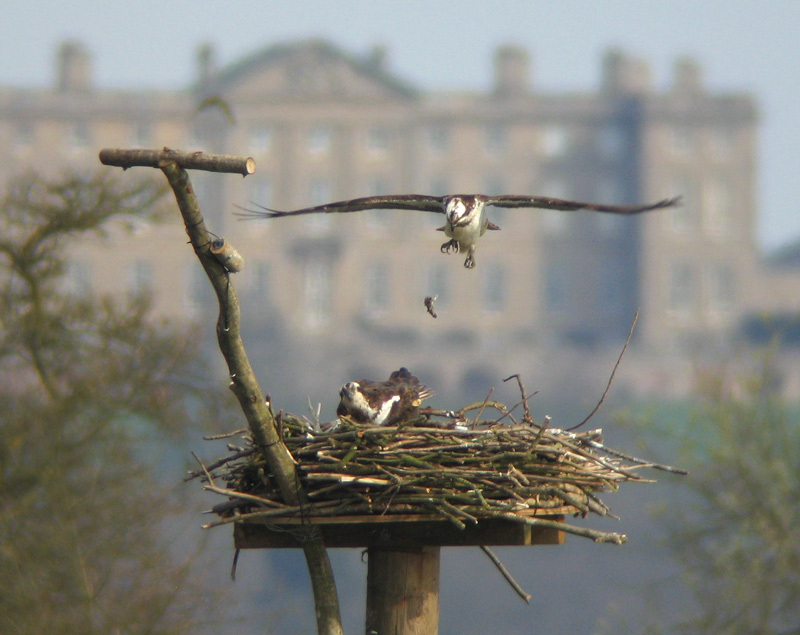 It is unusual to see a female displaying, so this demonstrated that the female now considers Manton Bay to be her own territory. 5N was not giving up without a fight though. Both birds were now gaining height, the unringed female attempting to shepherd 5N away from the bay. At one point the two birds must have been more than 3000 feet up; just tiny dots in a bright blue sky. Eventually they dropped down again and the chasing and 'chipping' began once again. 5N was not giving up. By 4:30pm the two females had gained height again and now they drifted south, leaving 5R alone in the bay. Another hour and a half passed before they returned, by which time 5R had headed off east from the nest in search of fish. The two females completed several circuits of the bay and then disappeared again. Ten minutes later 5R was back with a trout, oblivious to the fact that the two females had made a brief return. By 8:15pm it was dark and there was still no sign of the female. 5R though had only eaten half of the fish - keeping the remainder for the female for when she returned. But the question was, would she return? We checked the nest at 7am this morning and sure enough, the female was back! She had just finished the fish that 5R must have given her when she returned, and was cleaning her bill in the nest. Buoyed by her return 5R was making frequent trips to collect nesting material. Several successful copulations followed, and more significantly, there was no sign of 5N. Hopefully there will be no repeat of yesterday's amazing scenes. With the female back in Manton Bay, Shallow Water and Waderscrape hides are well worth a visit. You can access the Lyndon reserve from the minor road between Manton and Edith Weston. It has been a beautiful spring day at Rutland Water today; Willow Warblers and Chiffchaffs are in full voice around the reserve and the first Brimstones have made an appearance. The unringed female has again spent all day with 5R in Manton Bay, providing fantastic views for several hundred visitors to the Lyndon reserve. 5R returned with a fish just after 10am and after tucking into the head, he took the remainder to the female fifteen minutes later. Since then, the birds have been seen copulating throughout the afternoon. Still no sign of 32 on Lagoon 4 though. On Sunday morning, 03's mate returned to Site B (nest on private land). Her distinctive head and underwing patterns identified her as the same unringed female as 2009. With a female to feed, 5R has often made fishing forays around Manton Bay, providing great views from Shallow Water and Waderscrape hides. 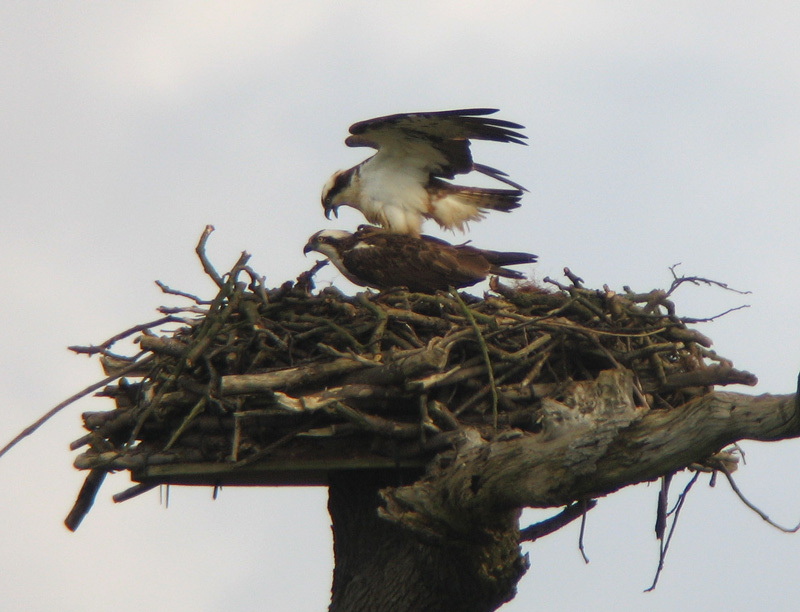 While 5R is away fishing, the female usually waits patiently on the nest. Nearby, work is continuing on the exciting habitat creation work at the reserve. 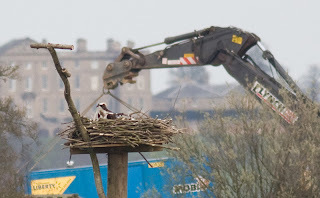 The Ospreys appear totally unconcerned by the presence of machinery working nearby, as this photo shows. While technology continues to fail us, Ospreys do not! Unfortunately we have still not resolved the problems with the website - but hope to have it up and running again by the end of the week. We do however have much better news from Manton Bay. The unringed female who spent much of last summer with 32(05) at the Lagoon 4 nest, returned on Monday evening. With 32 still absent from Lagoon 4, the female has spent most of her time with 5R in Manton Bay. Yesterday evening, after several unsuccessful fishing trips, 5R returned to the nest with a hefty trout just before 7pm. He wasted little time in presenting it to the female who took it to the nearby t perch to tuck into her meal. The fish was so large that the female still had some remaining at 8am this morning. Since then 5R has brought numerous clumps of turf to line the nest, and we've observed several successful copulations. The really interesting thing now will be to see what happens when 32 realises that the female is back. Will he return to Lagoon 4? If he does, will the female follow? We'll be updating the blog on a daily basis until the website is back online, so watch this space. Even better, why not visit Lyndon for yourself. You can get great views of the nest from Waderscrape and Shallow Water hides on the Lyndon reserve which can be accessed from the minor road between Manton and Edith Weston on the south shore of Rutland Water. 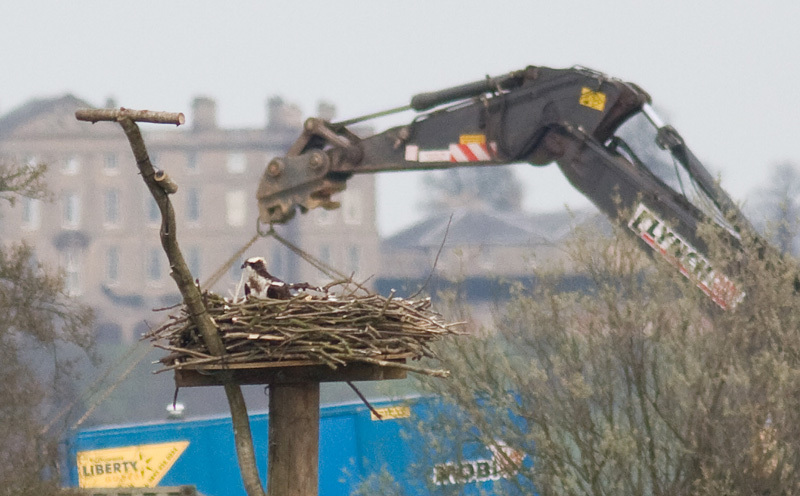 As regular visitors to the Rutland Ospreys website will know, we are currently having some technical difficulties with the site (and also the Rutland Water Nature Reserve site). Rest assured that we are doing our best to solve them, but in the meantime we'll be posting all the latest news from the project on this temporary blog. 5R has been present at the Manton Bay nest throughout the Easter weekend, providing fantastic views for hundreds of visitors to the Lyndon reserve. He has caught several fish within sight of the hides at Lyndon, so the reserve is well worth a visit at the moment! Elsewhere, last year's breeding female returned to the Site B nest (on private land) on Sunday morning. She is already looking very settled with 03(97) and the female who was present for several days last week has, rather predictably, moved on. 32(05) has again remained absent from the Lagoon 4 nest, meaning the Lyndon reserve is still the best place to see Ospreys if you are planning a trip to Rutland Water in the next few days. The reserve is signposted off the minor road between Manton and Edith Weston on the south shore of Rutland Water. More news and photos to follow during the week.